Fathima Benazir and Alex Paul used to be friends at school in Ooty, but then lost touch. Benazir studied biochemistry, while Paul took the engineering route to become director of IT service management at Zoho, where he spent close to 13 years. When they eventually reconnected over calls, both were ready to try something new. Paul was getting bored in Australia and wanted to come back to India. It helped that Benazir was an alumna. From giving the duo space to helping with various facets of the product, IISc’s STEM Cell incubator has helped the startup grow. Azooka is currently engaged in field trials of its product, which is used in molecular diagnosis but is safe enough to be ingested, unlike most of the other products that are used in such research. 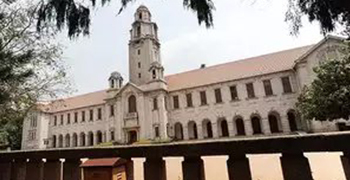 IISc, the highest-ranked institute for higher education in the country in most global league tables, has long been known for its research. It’s been making a concentrated effort to translate that knowledge into real-world impact. While there have been startups on campus since theearly 2000s, the initiative has picked up momentum since 2014. The institute has put in place policies to support startups that have science and technology at its core, by alumni, faculty or others as long as there is a societal impact. Startups can also license intellectual property from IISc. Currently under incubation, which typically lasts three years, are ideas in domains such as space, healthcare, agriculture and biotechnology. STEM Cell takes 4-10% equity in such enterprises. “As you know, IISc has been a research led institution… therefore, the focus has been on research and publishing papers in conferences. Not much thought was given to its relevance to society. You may become the top-ranked institute, but to the common man, it will be like, so what?” said CS Murali, chairman, STEM Cell, explaining the philosophy behind the push. Murali, an IISc alumnus who’s worked at Tata Consultancy ServicesNSE 0.22 %, IBM and Cognizant, said the thought of giving something back occurred to him during the school’s centenary celebrations in 2008: “Hundred years is a great number, but what can we do for IISc?” He and a few of his friends started mentoring startups at IISc informally that year. After retiring from Cognizant in 2012, Murali got into it full time. The earliest ventures from IISc included bioinformatics company Life Sciences and the handheld Simputer. “Around 2001-02, the first wave happened… Strand Life Sciences, Simputer… that helped us understand what it was. Not all of them succeeded–Strand is an exception,” said Bala Gurumoorthy, chief executive of IISc’s Society for Innovation and Development (SID). “The second wave happened around 2008, when Murali and others came on board. In the last three-four years, it has seen an uptick. It’s probable that this is a reflection of the change in the country as well,” he said, referring to the startup explosion in the last 10 years that created companies like Flipkart. SID, which was established in 1997 as a research and development bridge between industry and IISc, also supports entrepreneurship. The early engagements with startups did not have much support from the institute but that’s changed. Faculty members can be promoters or technical advisors and can hold equity. The policy, which came into being five years ago, allows them to spend one day a week in activities related to the company. They can take sabbaticals as well, allowing them to engage with startups full time. Every IISc-incubated startup gets a faculty mentor who’s a sector expert. For Rohan Ganapathy and Yashas Karanam, IISc has been an invaluable partner. The cofounders of Bellatrix Aerospace, both in their mid-20s and neither of them alumni of IISc, are building an electric propulsion system for satellites designed to use water as fuel. They were previously based in Coimbatore but were challenged by a lack of test facilities and expert advice. “Coming here, we have been able to scale things up faster,” said Karanam. “We are working with several departments and working with professors, using a lot of lab facilities available at IISc–this is the greatest plus point. No other incubator would have helped in getting such a big space. We have got a 1,000-square feet lab space dedicated for us.” Bellatrix is the only startup that the Indian Space Research Organisation (ISRO) is working with, having ordered its system for satellite missions.Azooka similarly works with various departments in IISc to finetune various aspects. “Within three years, IISc has helped us collaborate with the centre for nanoscience, we work with biochemistry, we take advice of molecular biophysics that helps us with structure, for liquid handling we take advice from the device instrumentation and control department,” said Paul. The Tata Trusts are using Pathshodh’s device for its rural healthcare programme. Bhat has taken a sabbatical to work on Pathshodh. About 350 kilometres away, the Indian Institute of Technology-Madras has been consistently successful in nurturing intellectual property-led startups for decades. 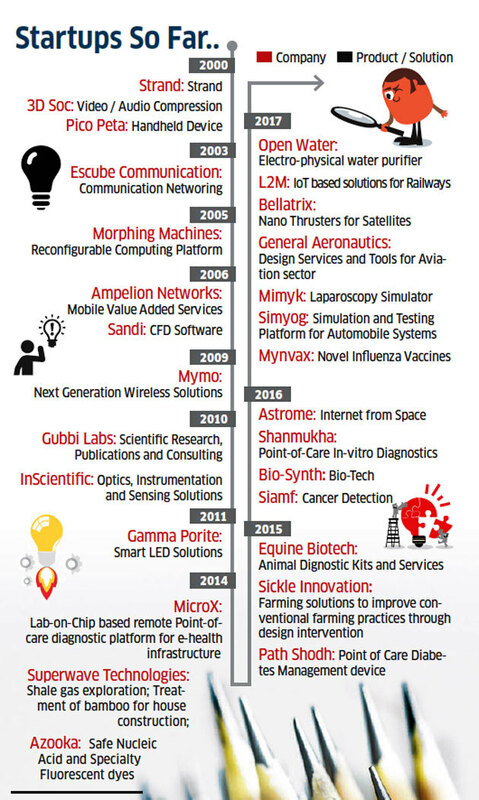 About 140 startups have been a part of the IIT-M Incubation Cell. IISc has nurtured about 28 startups, with more than half of them starting up since 2014. The aspiration is to bump up that number. Siana Capital Management–led by technology outsourcing advisor Siddarth Pai and former managing director and chief executive officer of IL&FS private equity Archana Hingorani–wants to raise up to $100 million to help academic ventures get funding, ET recently reported. Siana Capital struck an agreement with IISc recently that enables it to review startups and gives it the first right to provide seed funding. The pipeline is looking healthy, said Gurumoorthy, with April having seen more than 20 applications thus far. IISc is working on building a network of alumni mentors to help companies. “IISc has done this in the past,” said Narayanan Ramaswamy, partner and head of education, KPMG (India). “They have not done it like an incubation centre, the way they are doing it now. It is a timetested concept, and it is good that somebody like IISc, who represent research in India in very many ways, particularly, the basic sciences area… it is good that they are coming up with this.” One big success story could help pave the way for more.